Eric Schreffler, a member of Peñasquitos Lutheran Church, is the founder of Hands of Hope. Hands of Hope is a residential drug and alcohol center operated by Pastor Joel Portillo that uses the Celebrate Recovery 12-step program. The goal is to rehabilitate men through a new relationship with Christ. It all began when Eric traveled to Honduras with Shawn Plowman in 2007 and testified about his recovery. He then began working with Pastor Joel to purchase land, improve an existing building and train staff on how to use the Celebrate Recovery curriculum. Many men have successfully been rehabilitated at the center and have been reunited with their families and since found productive jobs. Since its inception, Hands of Hope has formed a non-profit legal entity to accept donations. Hands of Hope is now generating its own income through farming, raising chickens, and selling eggs. 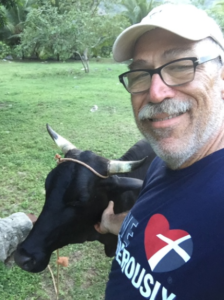 Hands of Hope has hosted missionaries and in July of 2018, a team of missionaries from PLC (including youth), led a Vacation Bible School in the community and helped to build the chicken coop. Hands of Hope provides a good example of the power of Christ’s forgiveness to others struggling with substance abuse. This project has also prompted Eric to start Celebrate Recovery at PLC which meets weekly on Sunday evenings.